Support Georgia wildlife at tax time? Check! If you’re a fan of the Berry College eagle cam (also shared on our website), you probably know that the comeback of bald eagles is one of our nation’s conservation success stories. In Georgia, DNR’s Nongame Conservation Section is working to make sure that success continues. We monitor eagle nesting statewide and work with landowners to protect nest sites. What you probably didn’t know is that we depend largely on your contributions to conserve eagles and other native Georgia wildlife species not fished for or hunted. This nesting season, support this work by contributing to the Georgia Wildlife Conservation Fund on your state income tax checkoff. We – and the eagles -- need you. Learn more. 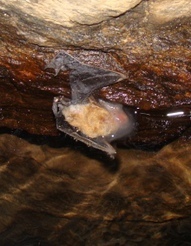 In early 2013, biologists documented white-nose syndrome for the first time in Georgia caves. Early this year, DNR-led monitoring documented the disease deadly to bats in two more caves. Tri-colored bats checked late last month in Kingston Saltpeter Cave in Bartow County showed symptoms of white-nose, the farthest point south the disease has been recorded. Even more tragic: On March 4, a team led by DNR biologist Trina Morris found significant evidence of the disease in Rabun County at the state’s largest known bat hibernacula. The discovery at Black Diamond Tunnel, a private, semi-flooded shaft named for the railroad company that started but never finished it, marks the first time that white-nose has been found in northeast Georgia. Signs of the infection greeted the researchers: dead bats piled on ledges and floating in the water; live bats with muzzles coated in the signature fuzz clinging to the rock ceiling. Morris and Jackie Jeffery of DNR’s Nongame Conservation Section were teaming with biologists Pete Pattavina of the U.S. Fish and Wildlife Service and Nikki Castleberry of the Georgia Museum of Natural History for the yearly survey of Black Diamond. The tunnel usually provides wintering habitat for an average of 5,000 tri-colored bats, formerly called eastern pipistrelles. But the landowner contacted DNR just days before the survey, saying she had seen a bat flying out of the tunnel during the day, not uncommon when white-nose is affecting hibernating bats. The survey confirmed the landowner's fears. Nearly 100 dead bats were observed. Also, in 2013, researchers counted 5,517 bats at Black Diamond. This year, they counted 3,472. According to Morris, the extreme cold this winter may be partly responsible for the sharp drop in numbers. But it’s too soon to tell, she said. Surveys for white-nose, commonly called WNS, will continue in Georgia through this month. Biologists will check several sites where they detected the disease last year to document the progress of WNS and any population changes. The discovery at Black Diamond wasn’t a surprise, Morris said. White-nose has been found in southern Appalachian sites in North Carolina and Tennessee. Yet the signs of the impact were “scary,” she said. Adding to the scare: Those signs seem reminiscent of how white-nose surged through Northeastern states, shredding bat populations. As we begin planning our vegetable gardens, and our roadsides and front yards look like pincushions of daffodils, Georgia’s hibernating bats still have a month of sleep, deep inside the state’s fragile Georgia cave systems. But starting late last month, bat biologists and cavers led by DNR’s Trina Morris went underground to check the health and population numbers of hibernating bats. Documented in Georgia for the first time in February 2013, white-nose syndrome is a deadly fungal disease that has killed millions of bats as it spread at a break-neck pace through Canada and 26 U.S. states. The non-native fungus that causes white-nose likely originates from Europe and arrived as an unwelcome passenger in North America around 2005, where it quickly started to move from state to state. 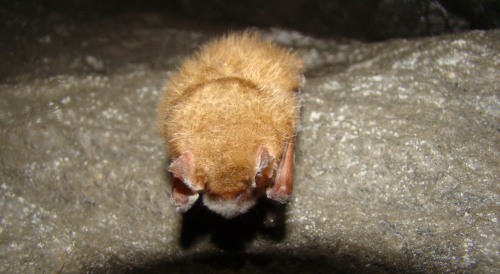 Georgia’s most common winter-hibernating bat species, the tri-colored bat, weighs about as much as a U.S. quarter. At such a small size, bats such as tri-coloreds need to remain in an uninterrupted sleep, or torpor, in caves to conserve energy until insects start to hatch again in the spring. White-nose syndrome irritates the bats’ skin, causing them to wake too often, burning precious fat reserves. Diseased bats, in a desperate attempt to find food, may leave their cave too early, only to freeze outside during frigid winter temperatures. As researchers race to find a cure, tracking the spread of white-nose syndrome and determining accurate population numbers of hibernating bats is paramount to understanding what the future holds for our native bat species. Pete Pattavina is a biologist with the U.S. Fish and Wildlife Service office in Athens. See his article "Finding a killer: on the trail of white-nose syndrome," posted in April 2013. DNR is working with cavers, cave owners and conservation groups to raise awareness about limiting trips into caves and following decontamination protocols for disinfecting clothes and gear, all part of the agency’s white-nose response plan. Please contact a DNR Wildlife Resources Division office or email GADNRBats@gadnr.org if you find dead or dying bats with fungus, or see bats flying outside during the day in winter months when they would usually be roosting or hibernating. Dead or dying bats with no signs of WNS should be reported to the local health department. When the crowds arrive in Claxton this weekend for the 47th annual Rattlesnake & Wildlife Festival, scores of animals will be waiting, from eastern diamondback rattlesnakes to potbellied largemouth bass. 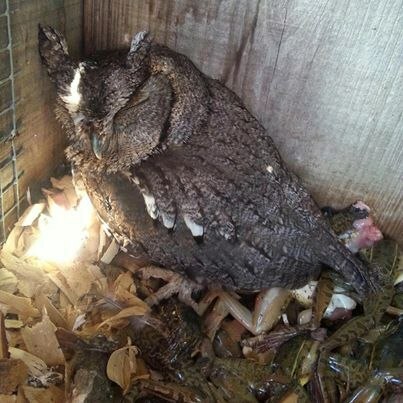 Collected from the four corners of the Southeast, the creatures are critical part of the focus of this south Georgia event, according to Bruce Purcell of the Evans County Wildlife Club. “We’re trying to promote common sense conservation of wildlife,” Purcell said. 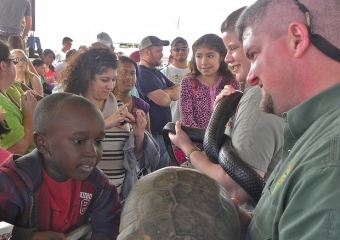 That effort varies from wildlife shows and exhibits featured in the two-day festival organized by the club to educational programs this week by DNR staff in elementary schools in Pembroke, Glennville and Statesboro. The outreach potential is promising. The festival itself, a mix of exhibits, contests and entertainment, is expected to draw from 15,000 to 18,000 people. "Considering that our town is only 3,000 people and our county is about 11,000, for that weekend we will have a real good crowd,” Purcell said. The strong turnout affirms organizers’ decision in 2012 to stop buying and selling wild-caught rattlers, transforming what was a rattlesnake roundup into a wildlife festival. The change drew strong support from conservation organizations and added to the event’s popularity. DNR and other organizations helped provide more than 100 rattlesnakes for visitors to see last year, plus another 100 snakes of other species. There will be plenty this year, as well. The festival will include DNR exhibits, fishing and hunting simulators, a birds of prey demonstration by Georgia Southern University’s Center for Wildlife Education, wildlife educational programs by Let’s Get Wild and Southeastern Reptile Rescue, and other exhibits by groups such as Orianne Society, a nonprofit dedicated to conserving imperiled snakes. There will also be a parade, food and craft vendors, and an appearance Saturday by actor John Schneider of "Dukes of Hazzard” fame. Festival hours are 8 a.m.-6 p.m. Saturday, March 8, and 10 a.m.-5 p.m. Sunday, March 9. Admission is $6 for adults. Children younger than 5 enter free. Fitzgerald’s Wild Chicken Festival is going strong and set for March 14-15 in this south Georgia city’s historic downtown area. Check out the lineup of exhibits, shows and other fun. A controlled burn at Tallulah Gorge State Park in northeastern Georgia proved a blazing success Feb. 26.
Credit for the prescribed fire, aimed in part at helping the gorge’s native table mountain pines and rarities such as white monkeyface orchids, roundleaf sundews and turkeybeard, goes to careful planning and execution by the DNR, U.S. Forest Service and other partners. More than 40 people, four agencies or organizations, and a DNR helicopter were involved. But burn boss Nathan Klaus of DNR’s Nongame Conservation Section also pointed to teamwork by the Forest Service and the DNR in advising the public about the burn. While Klaus considers the burn “a really big deal,” he also rated the companion outreach campaign valuable for prescribed fire efforts statewide. 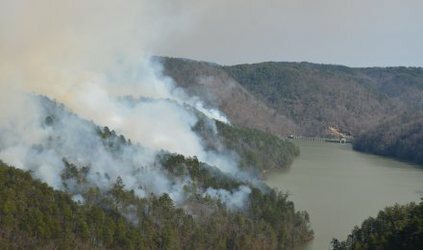 The joint operation between the Forest Service and DNR’s Wildlife Resources and State Parks & Historic Sites divisions marked the fifth burn in the last decade at Tallulah Gorge. Prescribed fire is vital to restoring and maintaining wildlife habitat in and along the two-mile-long canyon. The burn also involved the Georgia Forestry Commission, The Nature Conservancy and volunteers. The week of the Tallulah Gorge burn proved a busy one statewide for restoring habitats with prescribed fire. Shan Cammack, fire management officer for the Nongame Conservation Section, said the agency's seasonal fire crews burned more than 5,000 acres, including four aerial burns in a row. Besides the gorge, sites included Chattahoochee National Forest and a high-priority sandhills tract The Nature Conservancy owns in west Georgia's Fall Line sandhills. Cammack said the burns will benefit rare species such as bog turtles, mountain pitcherplants, smooth coneflower, gopher tortoises and more. Read this DNR Wildlife Resources Division blog post about burning at Oaky Woods Wildlife Management Area. An accompanying video features helicopter footage of dropping ping-pong-like balls containing flammable chemicals to help ignite fire lines. Also follow Wildlife Resources on Facebook for burn updates, including recent posts about Riverbend and Coosawattee wildlife management areas. Find more on prescribed fire at www.goodfires.org and the Georgia Prescribed Fire Council. Three DNR competitions are drawing Georgia children and teens outdoors. The Youth Birding Competition turns 9 this year, and coordinator Tim Keyes is seeing plenty of evidence the event is making an impact for conservation – from “growing” young birders to providing an event template for competitions in other areas. March 31 is the deadline for teams to enter the 24-hour bird-a-thon that runs from 5 p.m. April 25 to 5 p.m. April 26. Youth of all birding skill levels are encouraged to participate. More details. Coming sooner is the March 10 deadline for entries in the Youth Birding Competition T-shirt Art Contest. Entering is easy and winners will be picked from four age categories: primary (pre-K-second grade), elementary (third-fifth), middle (sixth-eighth) and high school. There’s also the Give Wildlife a Chance Poster Contest, held with the State Botanical Garden of Georgia. The 24th annual version of this contest encourages Georgia children in kindergarten through fifth grades to learn about the outdoors by entering artwork of native nongame plants and animals. The deadline for state-level submissions is April 16. State winners will be displayed at the Go Fish Education Center in Perry May 1-16. Complete details. 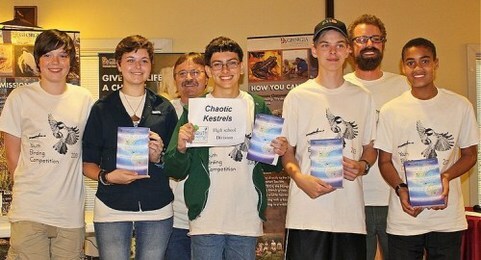 Sponsors for all three competitions include The Environmental Resources Network, or TERN, friends group of the Nongame Conservation Section. One aspect of the Youth Birding Competition includes raising money for conservation organizations. The event has raised more than $16,000 so far. Youth Birding Competition teams can share photos and updates on what birds they’re seeing or hearing on Twitter and Instagram. Simply tweet photos or post them on Instagram with the hashtag #YBC2014. Tag us on Twitter @GeorgiaWild and on Instagram @GeorgiaWildlife. When snow from the first winter storm covered much of the state with a stark white blanket a few weeks ago, Georgians were filled with mixed emotions. For countless school children, it was magical. Some adults enjoyed the Christmas card scenes. Some saw life suddenly made more difficult. Thousands driving home in the Atlanta area faced a living nightmare. I was fortunate that I was home when the snow storm began. Through the windows of my sunroom, I was able to watch the snow slowly filling up my backyard. While watching the scores of birds voraciously feeding at my bird feeders, I was reminded that snow often makes a harsh, frigid winter much more rigorous for our wildlife neighbors. 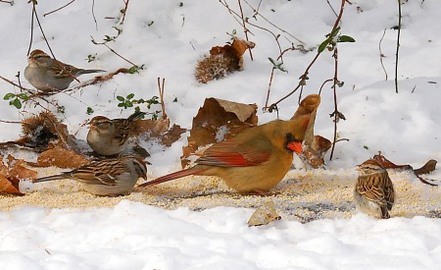 Read the rest of Terry’s column about the impacts of snow on backyard wildlife in Georgia. Terry W. Johnson is a former Nongame program manager with the Wildlife Resources Division and executive director of TERN, the Nongame Conservation Section’s friends group. “Out my backdoor” column archive. Video and photos of a partially successful attempt last month by DNR Nongame Conservation Section and Florida Fish and Wildlife Conservation Commission biologists to disentangle a North Atlantic right whale circulated worldwide among outlets as varied as Sky TV, The Huffington Post and the Irish Examiner. Whale No. 4057, still trailing some rope from its mouth, has not been seen since but could show up in Cape Cod Bay, where it was also spotted last March. Weekend for Wildlife, an annual event supporting nongame wildlife conservation in Georgia, raised more than $860,000 at Sea Island Jan. 31-Feb. 1. That’s the second-highest amount in the weekend’s 26 years. This year’s theme: Conserving endangered North Atlantic right whales. Partners including DNR, coastal counties and local and federal agencies have produced an aerial imagery dataset of coastal Georgia that offers the most high-resolution look yet at the region and will be used for everything from county planning to wildlife conservation. The orthoimagery, available as soon as April 1 at NOAA’s Digital Coast website, is “testament to our coastal counties, state and federal agencies’ willingness to work together to achieve regional goals,” said Jason Lee, Nongame Conservation Section program manager on the coast. See example photos. 2013 Forestry for Wildlife partners were announced March 6 at the State Capitol by Gov. Nathan Deal. Georgia Power, Plum Creek and CatchMark Timber Trust improved a combined 1 million acres for wildlife through the DNR program. Company representatives were given copies of “Natural Communities of Georgia” signed by the book’s authors and photographers. Photos of the presentation. 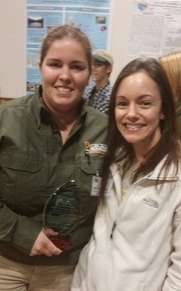 DNR’s Dr. Jessica McGuire, pictured at far left, received the 2014 Conservation Hero Award at the recent annual meeting of Southeast Partners in Amphibian and Reptile Conservation in Kentucky. McGuire, a Private Lands Program wildlife biologist who provides technical assistance to landowners, was honored for her "exemplary commitment to strengthening partnerships that further herpetofaunal conservation.” McGuire is active in Southeast Partners in Amphibian and Reptile Conservation and co-chairs the Gopher Tortoise Council. The first gopher frog egg mass of the year was found March 1 at Williams Bluffs Preserve in Early County. DNR and others are working to reintroduce the rare frogs at The Nature Conservancy site (“Eggs mark leap forward,” Feb. 28, 2013). At Fall Line Sandhills Wildlife Management Area in Taylor County, playback speakers installed in a wetland built by Nongame staff have been sounding out gopher frog calls, trying to lure the frogs to the site to breed. There's been no word yet on whether any have answered this call of the wild. National Invasive Species Week has passed, but it’s never too late to learn about invasives (invasive plants alone ring up nearly $35 billion a year in damages in the U.S.!). For starters, watch this webinar by Nongame Conservation Section biologist Eamonn Leonard on the Coastal Georgia Cooperative Invasive Species Management Area ("Coastal network targets alien invaders," April 17, 2012). Calling all birders: Researchers hoping to learn more about the migration of rusty blackbirds, one of North America’s most rapidly declining migratory bird species, have joined with eBird and others to organize a Spring Migration Blitz reaching from the southern U.S. to Canada. The first three weeks in March are time to report sightings in Georgia. Spotted turtles are also the focus of a citizen science effort, and March through May is one of the species' most active seasons in Georgia. Project details. Report observations of spotted turtles, with date, location and digital image, to john.jensen@dnr.state.ga.us. A large eastern indigo snake found in an area where the federal Natural Resources Conservation Service and landowners have worked to restore wetlands inspired this post on the U.S. Department of Agriculture blog. About 35,000 acres in south Georgia have been enrolled in a conservation easement program that enables owners to restore and protect wetlands – an ecosystem used by the federally listed indigo snakes. America’s Longleaf Restoration Initiative racked up improvements geared toward restoring longleaf forests on 1.38 million acres, according to the annual report of this public/private effort. The Range-wide Conservation Plan for Longleaf Pine is aimed at increasing longleaf forests to 8 million acres. Names in the news: The Georgia Chapter of the American Fisheries Society recently recognized three DNR fisheries employees. Craig Robbins and Chris Looney will share the honor of Fishery Worker of the Year, and Jimmy Miller received a certificate of recognition from AFS. Georgia Conservancy President Pierre Howard will step down June 30, after leading the organization for five years. Nongame Conservation Section senior wildlife biologist John Jensen co-authored a paper published in the Canadian Journal of Zoology on cave temperatures and lungless salamander abundance. Herpetological Review recently included research on hellbender movements and distribution done in part by Nongame wildlife biologist Thomas Floyd. Spring birding walks at Georgia state parks. March 16: 80th anniversary of the Migratory Bird Hunting and Conservation (Duck) Stamp bill. March 27: Conservation Field Day for landowners, Mary Kahrs Warnell Forest Education Center, Guyton. Details. June 1-5: Camp TALON (Teen Adventures Learning Ornithology and Nature), Georgia coast. "Poster contest open for K-5 students," Athens Banner-Herald. Also: "Kids encouraged to plug into nature," WXIA-TV (Atlanta). "Fishing rope cut from endangered whale off Georgia," National Public Radio (and others via AP). Also: "Tagging right whales," Duke University Nicholas School of the Environment blog. living in a wood duck box, this one had a stash of 21 leopard frogs! 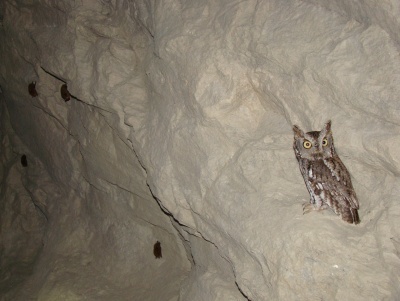 represent potential prey for screech owls.